A dangerous combination of tinder dry fuels and thunderstorms caused massive fires to rage last month, as hot and dry late-summer weather continued through September. Many of the blazes were sparked by a dry lightning storm that passed along the Cascade east slopes on the night of the 8th, and triggered around 90 separate fires in Yakima and Kittitas Counties. Despite high fire danger and generally unfavorable environmental conditions, fire containment efforts were helped by weak winds for much of the month. Unfortunately, this resulted in poor air quality during a significant portion of the month. A combination of active fires and stable high pressure caused smoke to build across the region, especially during the third week of the month. Had it not been for the thick smoke, monthly temperatures would have been warmer in areas such as Wenatchee. The lack of horizontal air mass exchange and limited vertical mixing facilitated the formation of a deep and widespread smoke layer over eastern Washington to an extent rarely seen in our region. A weak frontal system finally scoured out much of the smoke from eastern Washington on the 25th, and provided a brief yet much appreciated break from the unhealthy breathing conditions. Many areas ended the month rain-free once again, as dry streaks surpassed three months in areas like Pullman. Aside from the two or three cool days that arrived courtesy of the cold storm system that passed through the region on September 10th, most of the month was warm, dry, and benign. Cloud-free but smoky skies dominated eastern Washington for much of the month. Notable extremes for the month included instances of both hot and cold weather. 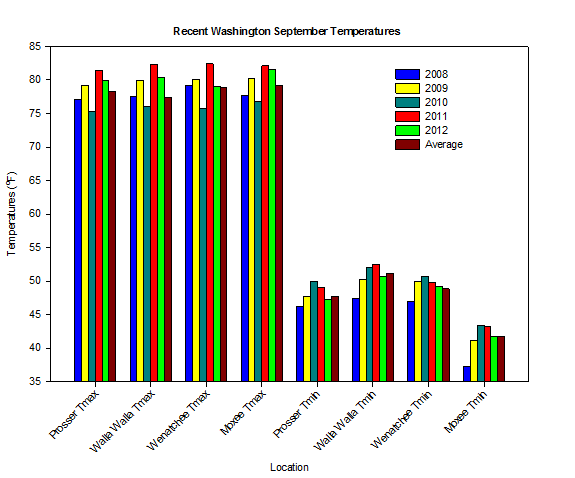 On September 7th and 8th, parts of Washington from the coast to the Tri-Cities exceeded 90 degrees. A few days later, the coolest weather of the month arrived, as Pullman dropped to 25 degrees on the morning of the 12th. Overall, day-time temperatures were above normal for the month, while night-time temperatures were below normal. The month began with seasonal conditions consisting of warm sunny days and clear cool nights. Very warm weather arrived on the 7th and 8th, as highs reached well into the 80s across most of Washington. A large area spanning from the coast to the Tri-Cities even surpassed 90 degrees. As the flow turned southerly on the 8th, moisture and instability spawned some late-summer thunderstorms. The storms featured significant lightning overnight and into September 9th, along with some light rain or sprinkles. Unfortunately, the lightning started numerous fires in Yakima and Kittitas Counties, which led to a quick deterioration of air quality across central Washington. The weather became cooler on the 10th, as a strong jet stream pushed a cool trough across the region. Though fast moving and not particularly wet, it was the first storm of the autumn, and marked a notable change from the previous summer-like weather. The high elevations in the Cascades received some light snowfall. Rain finally fell across western Washington, with up to 0.4 inches at 21 Acres, near Seattle. Windy conditions struck eastern Washington, with gusts around 40 mph recorded from Spokane to Pullman to the Moses Lake area. Highs were only in the 60s to low 70s area wide on Monday, September 10th, while lows in many areas dropped into the 30s on the mornings of the 11th and 12th. The lows were around freezing in several places on the morning of the 11th, while Ritzville recorded a low of 28.4 degrees in the cold air mass and clear skies. Very cool highs in the 60s and 70s continued despite sunny skies on the 11th and 12th. On the morning of the 12th, Pullman dropped to a chilly 25.3 degrees! On the morning of the 13th, Pullman again dropped to 31.3 degrees. Sunny, calm, and hot daytime weather returned for mid month. Early indications of the imminent warming included a high at Vancouver of 82 degrees on the 12th. Heat began to build strongly into western Washington on the 13th, as southwestern Washington experienced highs in the mid to upper 80s from Vancouver to Montesano and Olympia to the coast. Morning temperatures on the 14th were surging into the 60s in places like Anatone, Pullman, and Huntsville. A strong ridge of high pressure caused a prolonged spell of warm, cloud-free, and calm weather from the 17th to the 22nd for eastern Washington. Most eastern Washington locations climbed into in the 80s to around 90, with the exception of areas like Wenatchee that were mired in thick smoke. Days were particularly warm under the summery air mass, while mainly clear skies allowed many low lying areas to cool into the 40s and 50s during the night. While cool weather dominated the eastern United States, smoky air and high fire danger dominated Washington. Stable conditions limited the vertical mixing potential, and minimal horizontal advection did not allow for an exchange of large scale air masses. Having nearly the same air mass over the region for more than a week caused poor air quality across the region. Cooling came to the coast in the form of a marine layer and onshore flow on September 18th, while cooling arrived on the 19th in interior western Washington. While western Washington observed somewhat more seasonal temperatures, eastern Washington remained hot until the 23rd, at which point a monsoonal type upper low forced its way through the warm ridge. The associated clouds and moisture caused cooler weather in southern parts of eastern Washington from Yakima to Pullman to the Tri-Cities. 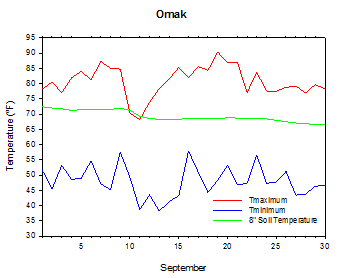 Highs were in the 70s and even 60s in most places, while areas around Omak soared well into the 80s. It was a strange pattern for late September, and quite late in the year to observe that type of unstable atmosphere. A weak storm and slightly stronger winds brought welcome air quality relief on the 25th. However, temperatures were still somewhat above normal in eastern Washington during the final week of the month, as poor air quality returned to many areas. Many large fire complexes remained active around the region as of the end of the month. Visible satellite images showed widespread smoke in the Wenatchee area and across much of eastern Washington during the week of September 17th to 23rd. A strange weather oddity occurred as a result of the smoky conditions. Despite a warm and mostly cloud-free air mass, thick smoke caused much of the Wenatchee area to record less than 50% of the total solar radiation that was received elsewhere in eastern Washington. As a result, Wenatchee experienced high temperatures that were only in the 70s on Tuesday, September 18th. Much of the rest of eastern Washington, including Omak, Yakima, and the Tri-Cities, observed less smoke and experienced highs in the 80s to around 90 degrees. The fire weather anomalies served as an interesting example of the feedback scenario that occurred between the smoke and the weather. As the land surface cools more quickly than the air aloft, the atmosphere becomes increasingly stable during the fall. The smoke blocked the sun, which kept the land surface cooler and more stable in Wenatchee, which led to diminished atmospheric mixing and decreased wind speeds, which allowed the smoke to persist in the area. Overall, long dry streaks continued in September in many locales. September's consistently warm and dry weather seemed to be an extension of August, as many fires burned across the region, and stagnant high pressure did little to disperse the smoke. Similar to last year, the hot and dry start to the autumn season indicated that summer was eager to linger into the fall. 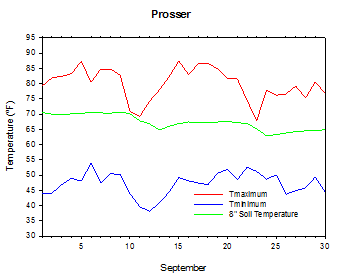 The average September temperature at Prosser (WSU IAREC) was 62.7°F, which is 0.3 degrees above average. The average high temperature was 79.9°F, which is 1.6 degrees above average. The average low temperature was 47.2°F, which is 0.5 degrees below average. The maximum temperature recorded last month was 87.5°F on September 15th, while the coolest daily high was 67.9°F on September 23rd. 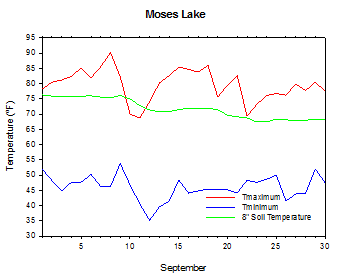 Low temperatures ranged from 53.9°F on September 6th to 38.3°F on September 12th. Daily average temperatures ranged from 69.2°F on the 6th to 53.4°F on the 11th. The monthly rainfall total was 0 inches. 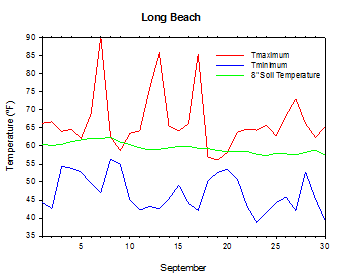 The average wind speed was 3.7 mph, and the average 8 inch soil temperature was 67.3°F. 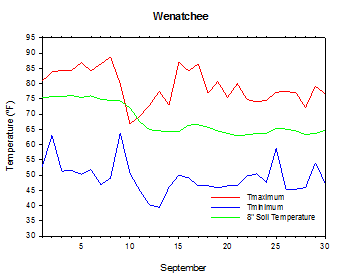 Wenatchee (WSU TFREC) recorded an average high temperature of 79.1°F, which was only 0.3 degrees above average due to the thick smoke that was present for much of the month. Mt. 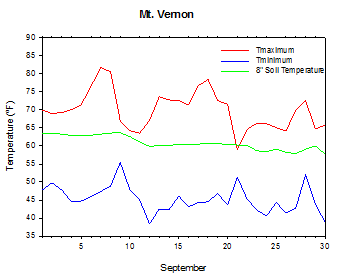 Vernon's September average low temperature was 45.3°F, which is 3.4 degrees below average. 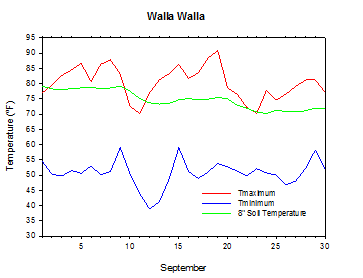 September 7th: The temperature at WSU Vancouver soared to 94.3 degrees. 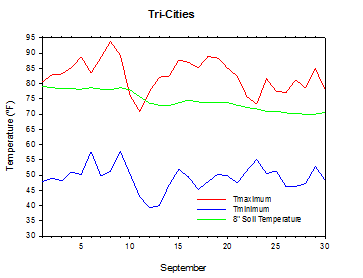 September 8th: The temperature at WSU Tri-Cities climbed to nearly 94 degrees. 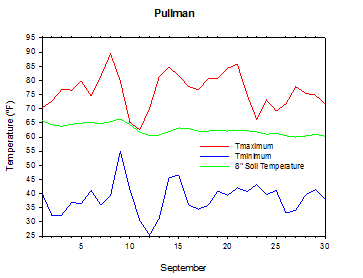 September 12th: The low temperature at Pullman fell to 25.3 degrees. September 25th: A weak weather disturbance provided just enough wind to temporarily relieve the poor air quality that had plagued much of eastern Washington since the middle of the month. The harvest season was well underway during September, as hot and dry weather continued. In Stevens County, grain harvest finished and yields were above average. In Franklin County, sweet corn and dry bean harvest continued, while the third and fourth cuttings of alfalfa were winding down. Winter wheat crop emergence reached 94% and more than 50% (as of September 23rd) in Adams and Lincoln Counties, respectively. The Yakima Valley apple harvest was underway, and included Gala, Golden, and Honeycrisp from the cooler areas of the County, and Granny Smith and Jonagold from warmer areas. Harvest of D'Anjou pears and apples continued in Chelan County, while potato and corn harvest occurred in Whatcom County. Grape and peach harvest was active in Klickitat County, while the final Snohomish County blackberries were picked. 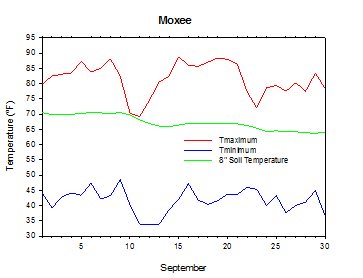 Aside from a few subfreezing mornings around Pullman, frost was generally a non-issue during September. In general, excellent fruit harvests continued at the close of last month (National Agricultural Statistics Service). On September 12th, 2011, the temperature at Prosser (WSU IAREC) rose to a toasty 95 degrees. According to the Climate Prediction Center (CPC), above normal temperatures are forecast for Washington during October, while drier than normal conditions are expected across western Washington. Near normal temperatures and drier than normal conditions are generally predicted for the late autumn and winter seasons, although slightly enhanced odds for above normal temperatures exist in eastern Washington. An El Niño Watch continues, as upper-ocean temperatures remain above normal in the tropical Pacific Ocean. El Niño conditions are expected to develop shortly, although a clear El Niño signal in the atmospheric circulation is lagging behind the warming ocean. Note that mild and benign winter weather is more likely in Washington during El Niño events.